The elbow is a hinge joint between the upper arm bone, which is called the humerus, and the lower arm bones, which are called the radius and the ulna. The ulna is on the inside of the elbow, also called the medial side. The radius is on the outside of the elbow, also called the lateral side. Similar to a hinge, the elbow has a central cylindrical dowel on the humerus, and a cradle that fits around the dowel on the ulna. The cradle rotates around the dowel as the elbow bends and straightens. 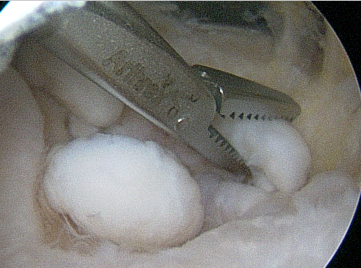 The joint surfaces are coated in a smooth, slippery cartilage surface. 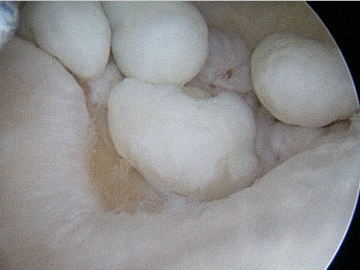 This cartilage surface is ten times more slippery than wet ice! Elbow osteoarthritis is a “wear and tear” disease in which the cartilage surfaces of the joint become damaged. Arthritis creates inflammation, swelling, pain, stiffness, and weakness. In an attempted healing response, the bone around the joint creates bone spurs that can limit motion and create pain at the end range of motion. These can also become loose pieces and debris within the joint. Over time, arthritis tends to get worse. Your doctor may recommend anti-inflammatory pills, physical therapy, or steroid injections. While these can make the elbow feel better, they do not fix the arthritis, improve motion, or prevent it from getting worse. Osteoarthritis is the most common form of arthritis. Other kinds of arthritis include rheumatoid arthritis (an autoimmune type of arthritis), post-traumatic arthritis (arthritis after an injury to the elbow), and avascular necrosis (arthritis because of loss of the blood supply to the elbow). Treatment for an elbow osteoarthritis is customized to the patient. Dr. Chalmers may recommend rest, anti-inflammatory pills, physical therapy, or injections. Many patients may find that they be able to modify their activities to reduce symptoms related to arthritis. Many patients will already have modified their lives and may not be even aware of it. If pain and stiffness continue, Dr. Chalmers may suggest surgery. 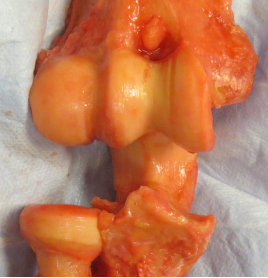 In early elbow osteoarthritis, often the cartilage is preserved. In these situations, arthroscopy to remove inflammation, loose bodies, and bone spurs can be very successful in improving range of motion and reducing pain. If all of the underlying cartilage has been damaged, arthroscopy is less likely to improve range of motion or reduce pain. Patients in this situation could consider an elbow replacement. Patients with an elbow replacement have a lifetime lifting restriction of 5 pounds. This procedure has a high complication rate and the replacement often fails, especially if it is not performed perfectly. Thus, Dr. Chalmers believes that this procedure should only be performed by surgeons that do the procedure frequently and Dr. Chalmers typically does not perform this procedure.